Our Funarena! : Test Cricket: Gambhir Dropped From Team India Against Australia! Test Cricket: Gambhir Dropped From Team India Against Australia! The opening pair of Gautam Gambhir and Virender Sehwag will not be in action in years for the coming two cricket Tests against Australia to be played in India. Since 2004 this pair has achieved the fifth all-time highest opening partnership average of 52.69 and the third highest of nearly 60 at home conditions. But taking into account only the overseas records the pair fails to even figure in the world list of highest opening partnership averages speaking volumes for India’s batting frailty in greener wickets abroad and recently at home too. Star opening batsman for India Gambhir finally gets the sack for the first two Tests of the 4-match India-Australia Test Series 2013 staring in Chennai from February 22. The chief national selector Sandeep Patil deliberated for over two hours at the Mumbai headquarters of the Board of Control for Cricket in India (BCCI) yesterday to select Team India for the first two Tests against Australia and decided to drop Gambhir for his indifferent performances and the recent home Test series loss against England. Gambhir who could not score a century in three years is likely to be replaced by either Shikhar Dhawan or Murli Vijay—these two players being given a chance for their good performances in the domestic circuit. Virender Sehwag who too suffered from non-performance like his erstwhile partner has been retained in a rather surprise move. Maybe his glorious unpredictability and home conditions were the considerations. One-day star Suresh Raina has also been ignored. With his good, tough and competitive record against Australia off-spinner Harbhajan Singh has been given the nod after being dropped in the Test Series against England in 2012. Playing his 100th Test the experienced campaigner would very much like to add to his tally of 408 Test scalps. Fast bowler Bhuvaneshwar Kumar who performed impressively in the ODI Series against England has been selected with Zaheer Khan, Irfan Pathan and Umesh Yadav still nursing injuries. Sachin Tendulkar joins the Test team coming fresh from some good knocks in the domestic circuit. Virat Kohli would definitely like to put behind his disappointment of 2012 and to start afresh in a tough series that matters a lot. Cheteshwar Pujara who showed a lot of promise against England must be hungry for more success with Ajinkya Rahane definitely not wanting to lag behind. Australia have already arrived in India and are fast acclimatizing to the conditions. They having always dreamt of conquering the last frontier in recent years must have smelt blood this time since England did just that in 2012. Skipper Michael Clarke would sure take heart from England’s showing and marshal his fast bowlers to disturb the suspect Indian batting despite the spinning prospects thanks to MS Dhoni. Australia would also want to contain their traditional rival Sachin Tendulkar at any cost. 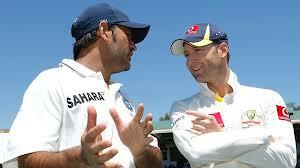 In all, this Series is set to be engrossing if India can match up to the aggressive Australians. The Australia Tour of India 2013 will have four Tests with the first Test in Chennai from 22nd February and it will conclude on 26th March. There will be no one-day international series, because the spicy cricket bonanza called IPL in its sixth avatar starts from 3rd April and is set to put everything called cricket too on hold till the end of May, 2013. Team India: MS Dhoni (c), Virender Sehwag, Shikhar Dhawan, Cheteshwar Pujara, Sachin Tendulkar, Virat Kohli, Ajinkya Rahane, Murali Vijay, Ravindra Jadeja, Harbhajan Singh, Ravichandran Ashwin, Pragyan Ojha, Bhuvneshwar Kumar, Ashok Dinda, Ishant Sharma.